As with previous missile and nuclear tests by the DPRK, this test was accompanied by provocative rhetoric, threats and counter-threats from both sides. But evidently this is of most concern coming from the US, as the US actually has the capacity to carry out its threats, whereas despite the blood-curdling warnings in the Western media, Kim Jong-un does not. North Korea’s claims have included that US cities are now within the reach of its missiles, that it plans to ‘contain’ the US base in Guam and it would respond to US attack by putting ‘an end to the US’. However these threats are in reality preposterous; North Korea does not have the arsenal to inflict any damage whatsoever to the US mainland or Guam. Such threats are however very dangerous as they are used in the West to whip up public opinion against North Korea, and in support of any response made by the US. The US, on the other hand, definitely does have the capacity to obliterate the DPRK many times over. It is therefore of great concern that, in response to the latest test, US defence secretary Mattis threatened North Korea with a ‘massive military’ reaction; and that hardline Republican senators like Lindsey Graham, told the BBC that the US should be willing to contemplate 100,000s of civilian deaths to bring North Korea to heel. Regarding the fundamental background to these events it is US foreign policy, particularly since the 2002 launch of the so-called ‘war on terror’, that has led to this crisis. In 2003 Bush, backed by Tony Blair, faked evidence of a continuing Iraqi nuclear programme to justify by-passing the UN to pursue illegal ‘regime change’ in that country. After defeating the regime through its military policy of ‘shock and awe’, Saddam Hussein and his family were hunted down and he hanged by a kangaroo court. In Libya, Gaddafi drew the lesson from this that he must make a deal with the US and actually close down the Libyan nuclear programme; but this did not protect Libya from NATO bombing, nor Gaddafi also being hunted down like an animal and murdered with the tacit backing of the West. The same was intended for Assad; but with Russia backing the regime, and the populations of the US and Europe growing wary of both the costs and domestic blowback from such wars, the US was unable to simply bomb its way to overthrowing Assad. In other words, the main threat to world peace comes from the US’s record of unilateral military actions – exactly as those who opposed them warned at the time. For small states that are in the crosshairs of the US the lessons are crystal clear. There is no persuasion, no talking, no UN that will protect you if the US decides to come for you. The only solution is to do what is possible to deter the US by building up a sufficient arsenal, including nuclear weapons, so that the threatened collateral damage acts as a brake. And North Korea has plenty of reasons to feel threatened. Obama’s 2010 ‘pivot to Asia’ – which is one Obama policy that Trump is not reversing – was universally understood to be aimed at containing China, but within this North Korea was set up as a convenient scapegoat and cover for the US’s real intentions. For example, the stationing of the THAAD missile defence system in South Korea was proposed in response to North Korea, although its main target is really China and Russia – THAAD is a far too powerful system, with radar ranges of thousands of kilometres, to be aimed purely at North Korea. From 2010, US bases in South Korea were expanded, with a new base, Fort Humphreys, slated to become the largest US base in Asia. 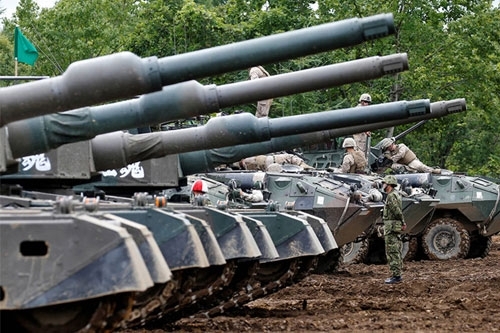 Meanwhile North Korea’s other unfriendly neighbour, Japan, embarked on a sharp increase in its military spending and deepened its military collaboration with the US. The DPRK’s August firing of an unarmed missile over Japan’s northernmost Hokkaido Island took place the day after the conclusion of US-Japan Northern-Viper-II wargames on the island that simulated invasion of North Korea and a ‘decapitation’ operation to remove the regime. The US has also stepped up the scale of its annual Key Resolve/Foal Eagle land and sea based training exercises held jointly with South Korea, which the North Korean government had regularly objected to. The annual training exercise was already the largest held globally by the US, and from 2010 it was upgraded continuously. In 2013 B-2 and B-52 bombers were included; the exercise in 2016 was the largest to date. The threatening mien of this escalating US military presence, plus the evidence of the US’s practical implementation of ‘regime change’ since 2003, is the reality that has driven the North Korean nuclear programme, which was restarted in 2003 after being suspended under the ‘Agreed Framework’ with the US in the late 1990s. The DPRK knows its nuclear weapons cannot defeat the US, but they can offer sufficient threat to South Korea and Japan that they will act to stay the US’s hand on military action. And threaten some damage to US assets as well. However, the real defence of the DPRK is that offered by China and Russia. Quite apart from the fact that China has no more intention today than it showed in 1950 of allowing the US to be able station its troops on the Yalu river that runs along its border with the DPRK, both China and Russia are determined that the US will not spread its policies of devastation and instability (as seen in the Middle East) to their backyard. And it is in this regard that the behaviour of North Korea becomes rather less reasonable or defensible, and more straightforwardly provocative, as despite China’s role as its chief international defender – alongside Russia – and key economic and trading partner, North Korea refuses point blank to listen to its advice or take account of its concerns. China does not make a big campaign against the DPRK’s nuclear programme, but does suggest that the DPRK should proceed quietly and calmly, refrain from provocative rhetoric and unrealistic threats, and present itself as reasonable, balanced and prepared to talk. China would have liked to see more positive signs in response to openings like the election of a South Korean president committed to easing tensions with the North, which might have positively impacted on Moon’s own wavering. China’s – and Russia’s – proposal in relation to the current crisis has been dubbed ‘freeze-freeze’: that the US agrees to refrain from holding military exercises off the North Korean coast and that North Korea suspends its nuclear programme to allow talks to take place. China has stood up to the West’s demands that it impose comprehensive sanctions on North Korea, which would wreck the DPRK’s economy. But China is also concerned to avoid a complete breakdown with the West, so earlier in 2017 it agreed to a fig leaf of some limited sanctions on North Korea. Rather than showing understanding of the corner that China had been placed in, North Korea’s state media denounced China for crossing a ‘red line’ and for ‘dancing to the tune of the US’. North Korea followed this up by scheduling missile and nuclear test at times chosen to most embarrass and create difficulties for China. Thus, in May, a missile test was launched hours before president Xi was due to open China’s key 2017 international event, the ‘Belt and Road Forum’ in Beijing, convened to take forward proposals for improved overland and sea communication links across Asia to the West. Similarly, early September’s nuclear test was timed for the eve of the 2017 BRICS summit that was convening in Xiamen. There is no doubt that these tests were deliberately timed as a snub to China. This is completely unreasonable behaviour by North Korea and makes its defence against the US harder. Rather than berating China, Kim Jong-un should learn from how it handles its international relations, and listen rather more to its well-judged advice on how North Korea should conduct itself internationally. However, in the final analysis, it is the US that holds the key to the situation on the Korean peninsula. The speeded up development of North Korea’s, still very primitive, nuclear arsenal and its missile tests are not the real threat to peace in the region. Rather its is the US’s evident capacity to inflict nuclear annihilation, and a White House that is making escalating threats to actually use it, that creates fear in every thinking person’s breast. Overall, the US will probably not make such a reckless step, primarily because China and Russia stand behind North Korea – which together could inflict great damage on the US, even if the DPRK cannot – and Trump cannot be sure what they would do in response. But that just means ongoing crisis and tension in the region. If the US really wanted peace and to persuade North Korea to mothball its nuclear programme it would not only have to eschew ‘regime change’, but offer clear security guarantees on the ground, including ending its provocative war games off its coasts. The above article by Jude Woodward was originally published on the New Cold War blog here.